Instead of rolling their own OS from scratch, embedded developers now roll their own OS from Linux source. 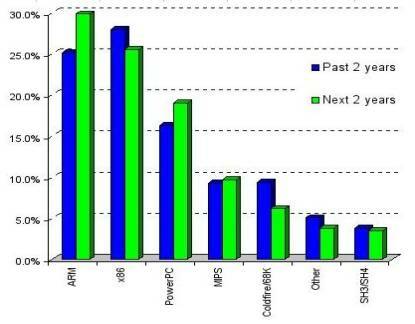 The barchart shows that, collectively, embedded Linux vendors including MontaVista, Metrowerks, TimeSys, Denx, Sysgo, LynuxWorks, and FSMLabs have supplied Linux for only 22 percent of projects during the last two years, projected to reach 24.2 percent over the next two years. Most people immediately turn to Intel for a platform. 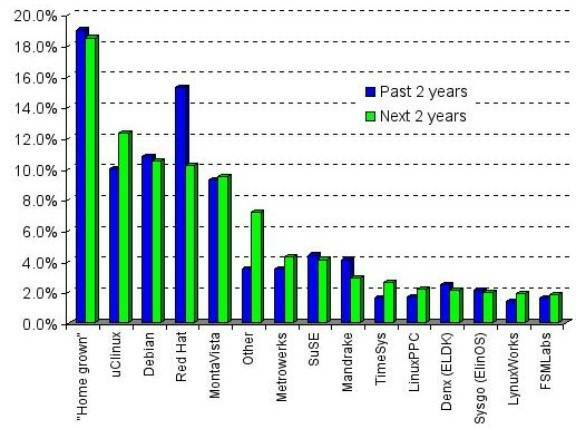 If you are running high performance commodity systems this makes sense. For smaller embedded systems the Intel X86 architecture isn’t necessarily the best choice. ARM — including StrongARM and XScale architectures – are gaining on x86 as the most popular processor architecture for embedded development. This year’s results show that trend continuing. And, for the first time, embedded Linux developers are projecting that they’ll base more projects on ARM than x86 processors in their projects during the next two years. Linux is a disruptive technology. A once in a generation paradigm change. If you don’t change your methods of dealing withsoftware support, you will not benefit. Let’s examine the issue of support in Open Source Systems. There are three viable approaches in dealing with support issues in Linux. Get support from a large foreign software company. Why go to Linux and then sell your soul to the devil? There are a number of local companies that can provide support for embedded Linux. The nice thing about this approach is that the local companies are not at a disadvantage since there is no proprietary or hidden software in the embedded Linux solution. Just look around you, there is plenty of talent in this country. No ” vendor lockin” . Since everything is open you can provide your own support. This is definitely the most effective, but it needs the largest investment of time and talent. There is a lot of help available on the Internet and recently published books. 7 – I want it to run real fast. Well boy you need real time. This confusion is largely propagated by companies that sell RTOS’s. The use of RTOS’s in embedded systems is mostly a historical anomaly. 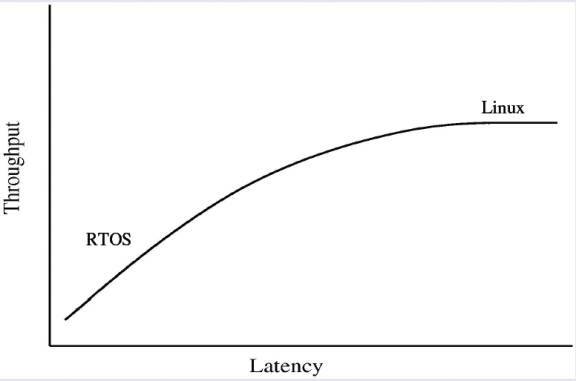 Real time systems are optimized to minimize worse case latency (the response time). Interrupt latency is usually the criterion that defines how “Real Time” the operating system is. RTOS are usually needed to control hardware that has strict time constraints. Embedded systems are systems with limited human interaction. These systems are sometime very small but not necessarily. The embedded computer market is huge The shipment volume of embedded systems is much larger than the PC computer market. Real Time – Says Who? The majority of realtime systems aren’t. Embedded systems are often misclassified as realtime systems. However, most systems simply do not require realtime capabilities, in fact these capabilities are detrimental. Realtime requirements are often simply designed out through the use of a deeper hardware FIFO, scatter/gather DMA engines and custom hardware. So You Still Want Real Time! Posix.4 adds realtime facilities to Posix. This standard add the facilities typically used in RTOS’s. In my opinion using these facilities are a recipe for trouble. There are no standard Linux programs that use these facilities, just look at your favorite Linux distribution. Linux supports some very powerful abstractions that should be preferred over many weaker techniques. While this is difficult to classify as a mistake, it is worth noting that virtually no standard Linux programs are written in Java. Sun itself uses GnomeGtk for its desktop, which is written in C. If Java is so good why doesn’t Sun use it. Sun releases a SUSE version of Linux, without any Java programs, and dubs it the ” Java Desktop System” . Embedded environments many times have restrictive resources and the software must be properly scaled to run on the platform. Things that are appropriate for a large enterprise server, such as Apache, PHP, graphical toolkits that are familiar to many Linux users are just too big for restricted embedded hardware. Trying to squeeze these large programs into small flash memory is just no fun. The main problem with threads is that they are hard to use correctly. Even for experts,development is painful. 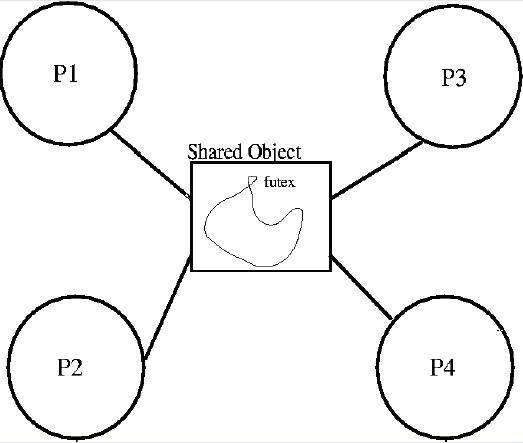 Must coordinate access to shared data with locks. Forget a lock. Corrupted data. Each process waits for some other process. Simple locking (e.g. monitors) yields low concurrency. Finegrain locking increases complexity, reduces performance in normal case. OSes limit performance (scheduling, context switches). Hard to port threaded code (PCs? Macs?). Kernel calls, window systems not multithreaded. Few debugging tools (LockLint, debuggers?). One execution stream: no CPU concurrency. Register interest in events (callbacks). 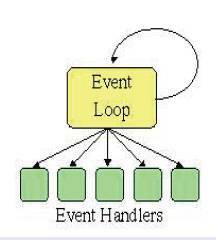 Event loop waits for events, invokes handlers. No preemption of event handlers. 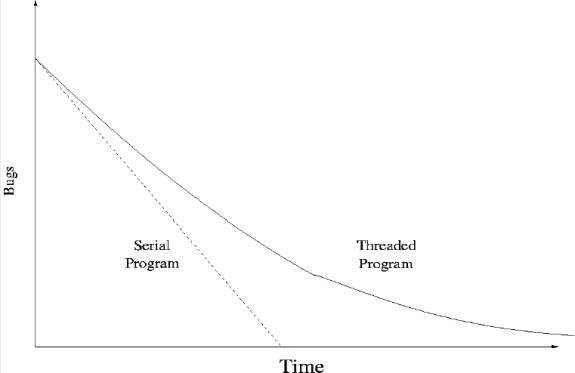 Use processes for concurrency rather than threads. Synchronize processes with event based IPC. Simpler and surprisingly more efficient synchronization than threads. send/rcv is self synchronizing and buffered. No race conditions. Much simpler to debug. Trivial to distribute. Instead of sharing all memory, create processes with a shared memory region. 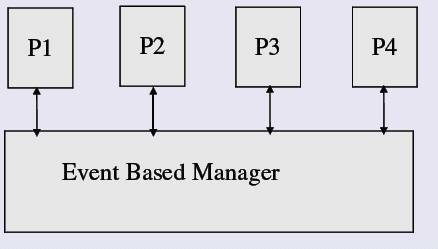 This allows you to minimize the interaction of the processes to a well defined subset of the total memory space of the application. Thread safe libraries are not needed. Use POSIX 1003.1b semaphores to synchronize shared data. The source is your friend. The GPL creates a unique situation that makes many embedded devices transparent. The WRT54G wireless router is a case in point. Linksys eventually released the sources. You can just download it from their web site. This launched ” The Little Engine That Could” . They have done very well with this product. If you want to design an embedded Linux product just look at the completely transparent design of the WRT54G for a guide on how to design an embedded system. Israeli companies tend to ignore the finer details of legalities. Violations of the GPL are a serious matter. Recently the GPL has been upheld in its first court test in Germany. The authors of netfilter, Linux’s firewall, has been granted an injunction against Sitecom Germany GmbH for GPL violations. Pingback: Medical device security | Software Associates.